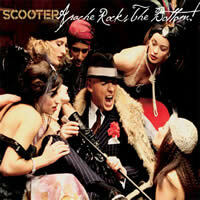 In the past, I have been considerably supportive of all of Scooter's different forays into different styles of music. I even supported "Suavemente", their 2005 single which brought latin house music to the masses by sampling Elvis Crespo. And now, we have their latest (at this point in time) single, "Apache Rocks The Bottom", which takes elements from two of the tracks from their latest album, "Who's Got The Last Laugh Now? ", and combines them into one hard dance amalgam. The result? A novelty tune that is far from original, and far from extraordinary. The Radio Edit of "Apache Rocks The Bottom" starts off with a dramatic gangster opera type of introduction, followed by a kick/bland bassline combination. And of course, lest we forget the inane rantings of H.P. Baxxter, telling us to "take care to get what you like, or you will be forced to like what you get... RIGHT?!" Pure poetry, isn't it? (No.) After all that jazz, and the occasional special effect, we get the main choral theme, yanked almost directly (occasionally they cut it up a bit so it reflects the sound of a skipping record) from "Apache" by The Shadows (and written by Jerry Lordan! Whaddya know!). Yep. That's the kicker. Then another enlightening H.P. verse, and another Apache chorus. We also are treated to an additional background melody with a faint synth tone, but I doubt they composed it themselves. Then more Apache chorus while H.P. shouts "Rock bottom! Join the jams!" and a computerized voice also saying "Rock Bottom". That's pretty much it: average at best. The Extended Mix is just the Radio Edit with time-filling build-up beats at the beginning and end. The Dub Mix is nothing special either, as it is pretty close to the Extended Mix, just without the lyrics. All we get is the computer voice saying "Rock Bottom" on the rare occasion. Other than that, it's pretty much the same. The intro and outro are a little more polished, but don't expect that to redeem this track. Following this is the Club Mix of the song "Apache" from the album (NOT "Apache Rocks The Bottom"). While this song is not particularly exciting in its own rite, it has a funkier bass thing going on (which, to the best of my knowledge, was 'borrowed' as well) which compliments the Apache theme tune. This track is alright; I like how they chop up the Apache sample near the end. We are also treated to a 30-second snippet of "Apache Rocks The Bottom"! Yay! ...What am I supposed to do with this? Well, it pretty much sums up the entire single, so use it to impress your friends without subjecting them to all the mixes. Normally, Scooter includes a nice B-side with their singles, and they are always nice because they are original compositions from the band. They're also usually short so we can just jump right into the action at the beginning without extensive build-up (I like that too). Unfortunately, what we have here is... a TRAVESTY! We have Countdown, where a loud timer ticks in the background while H.P. counts down for one minute, speaking at regular intervals: "One minute to go... fifty seconds to go... forty seconds to go..." and so on. Then when he reaches zero, we get an explosion and a brief aural fireworks display, and then that's it. Nothing to dance to, nothing to headbang to, just fireworks. Very disappointing. So all I can really say about this single is that Scooter had better re-evaluate their current position on their music. They've had great singles in the past, and some of the songs on their latest album have great potential. But they mashed together two average tracks to create one slightly sub-par song. And then they have the audacity to create an absolutely s**tty B-side. These guys just need to try harder and not look for the easiest way out when they work on their next release.